Holey Corona, Batman! What are all of those dark areas on the sun? When we look at the lowest and middle layers of the sun, it appears relatively uniform with small dark (sunspots) or bright (active regions) blemishes. However when we look at the outermost layer of the sun’s atmosphere, the corona, something bizarre happens – large chucks appear to be missing. These large dark regions are called coronal holes and are some of the most fascinating solar features we routinely observe. Both casual and scientific descriptions of coronal holes have been documented as far back as the early 1900s during solar eclipses. They were first noticed as rays of light streaming out from the solar poles, which appeared similar to the magnetic field lines of a bar magnet. The first direct images coronal holes on the disk of the sun didn’t start until early in the space age. In the late 1960s and early 1970s, they could be seen as isolated dark patches in UV and x-ray images. The definition of these dark patches was refined to be what we know now as coronal holes by solar instruments on the Skylab space station in 1973 and 1974. The Skylab data and subsequent rocket missions helped to define characteristics of these holes. They routinely appear as dark caps in both the north and south poles of the sun and as large, often stretched-out, expanses in mid-latitude and equatorial regions. One of the most fascinating aspects of coronal holes is that they are some of the most persistent features on the sun. The mid-latitude and equatorial holes typically last for at least a few months and up to nearly a year. Polar coronal holes can endure for several years at a time. In fact, polar coronal holes completely disappear only at solar maximum for about year before they return as solar activity declines. Sunspot numbers continue to decline as we approach a solar minimum leading to less coronal mass ejections that could potentially spark geomagnetic activity. During solar minimum coronal holes is the main space weather phenomenon that produces geomagnetic activity. Coronal holes allow for solar wind to escape easily and in result earth experiences enhanced solar wind speeds which in return can spark aurora activity. Don’t worry aurora lovers, solar minimum doesn’t mean the sky will go quiet and we can thank coronal holes for that. Scientifically speaking, the term “coronal hole” simultaneously refers to three distinct phenomena depending on whom you are talking to. These differing perceptions of coronal holes have the same physical root, yet a one-to-one mapping of features between them has never been accomplished. First, the dark patches that appear in coronal x-ray and ultraviolet images are called coronal holes (just to confuse things, these same regions appear bright in the He I 10830 Å triplet). 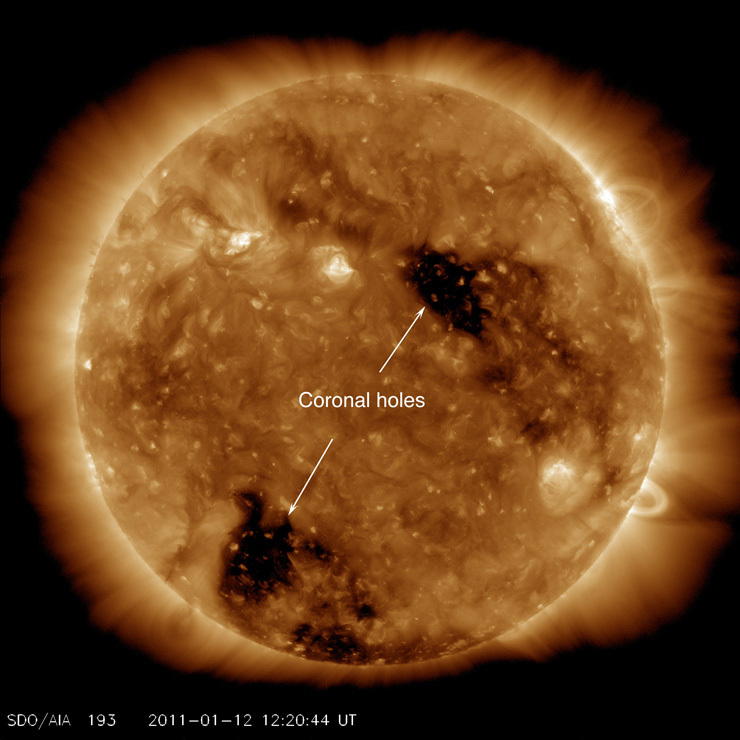 Second, the lowest intensity regions observed outside the limb of the sun are called coronal holes; these regions were first observed during natural (i.e., the moon) and artificial (i.e, coronagraphs) eclipses. Third, a largely theoretical definition of coronal holes is described, in which coronal holes are explained by open magnetic field lines extending from the solar surface outward into space (the precise length needed for a field line to be considered “open” is up for debate). All three definitions describe regions of low plasma density occurring in the corona where ionized atoms and electrons are free to flow from the sun’s surface outward into space along magnetic field lines. The reason why coronal holes appear dark is because the hot plasma that typically glows in the corona at millions of degrees is being swept away by the magnetic field. All of this hot plasma being blown out means that coronal holes are the primary source of the fast component of the solar wind that envelopes Earth as well as the rest of the solar system. Understanding the origin of the solar wind is critical in producing accurate space weather forecasts for our satellites, our astronauts, and our planet. Coronal holes are hard to define not only in scientific terminology, but also in images of solar corona as well. Mapping the shape of coronal holes is kind of like trying to measure the edge of a cloud – it is easy to tell what is definitely a hole and what definitely isn’t, but the boundary is fuzzy and different observers will mark the edge differently. To complicate things further, coronal holes appear differently in different wavelengths. The size, shape, and darkness of any given hole are not consistent between separate observing filters. The theoretical definition doesn’t help much either, since it is dependent on coronal magnetic fields and we currently have no way to independently measure the intensity and location of coronal magnetic fields. Like almost every other outstanding issue in observational science, more data is needed to resolve the problems with distinguishing and simulating coronal holes. Ultimately, we need coronal vector magnetic field measurements to link the off-limb regions to dark patches on the disk and to model the physical origin of holes. Two upcoming solar missions will have the capability to greatly improve our understanding of coronal holes: the ground-based observatory Daniel K. Inouye Solar Telescope and the satellite Solar Probe+. The Daniel K. Inouye Solar Telescope (DKIST) is expected to image the sun in unprecedented detail beginning in 2019. Among the expected capabilities of DKIST’s instrument suite is the ability to image the off-limb corona with enough signal to measure the emerging coronal magnetic fields. Solar Probe+ will launch in 2018 with an orbit that will come closer to the sun than any manmade object ever has. Solar Probe+ will actually fly through the fast moving plasma and magnetic fields that define coronal holes and make measurements of temperature, magnetic field strengths, and particle density. The combination of both of these new observatories with our current extreme ultraviolet lithography (EUV) imaging satellites will hopefully resolve the ambiguities in coronal holes and ultimately give us the ability to forecast the effects of coronal holes on our planet. Dr. Michael Kirk works as solar physicist at NASA Goddard Space Flight Center and is a research associate with Catholic University of America. His current research include solar image processing, coronal hole mapping, and science communication. Share this post by clicking an icon below! This entry was posted in Education, Solar Events. Bookmark the permalink. I am so glad to see this information and to read and build an understanding of how the sun works and how it can change your life. It is very fascinating to learn about it. I am learning how to work with the “disaster app” and the understanding of the affect it has on the earth. Aurora chasing in Alberta – what’s it like to see STEVE in real life? Lava Lamp or the aurora? Debunking the aurora myth: What actually causes an aurora? Notanee Bourassa on Aurora chasing in Alberta – what’s it like to see STEVE in real life?